The events of last week in the US have been a shock to us here at FreakLabs. As an organization, I've tried to build this company to do things to try to improve the world such as environmental monitoring, agriculture technology, renewable energy, and humanitarian work. We've been involved in working through natural disasters, helping displaced people, and monitoring endangered areas. In my mind, one of the greatest disasters I've experienced so far in my life occurred last week in the 2016 US presidential election. When I was a child growing up in Southern California, as a Chinese-American, I always wondered why my family seemed so much different than the families I see on TV. We spoke a different language at home, we ate different food, and our family culture was completely different than what I was exposed to in American pop culture. My sister and I were the only Chinese people at our school for a very long time. There were times when I walked home and kids riding their bike would spit in my face as they rode past me. I had to endure constant bullying and kids saying "Ching chong ching chong" and pull the corners of their eyes up to make them slanted. The racism and bigotry of the kids around me were obvious and it made me feel isolated and alone. As I grew up, I mainly hung around other Asians because I could never feel like I was part of a pure American culture. It was only after I left the country and became an expatriate living in Japan that I could feel how American I am. Meeting other Americans abroad, we shared a common language, culture, and a belief that no matter how hard it was for me as a child, our country was one that was moving towards racial diversity, cultural diversity, and progressive ideas. I was and still am extremely proud of my country because of that. Last week, in the election where Donald Trump prevailed, it wasn't /that/ country that elected him. That wasn't the country I was proud of, of promoting tolerance, understanding, and a melting pot of cultures. It wasn't the country that was welcoming to the immigrants that sought refuge from whatever problems they had, no matter what era it was. It wasn't the country that built itself into an economic powerhouse on the backs of the immigrants that created it. It's ironic that Donald Trump came from the same area that also houses the Statue of Liberty, the beacon of hope for migrants and refugees crossing the ocean, signaling they came to safe harbor. The country I believe in wasn't the one that elected Donald Trump. FreakLabs is a company that values tolerance, diversity, community, and social activism. I, as a representative of FreakLabs, want to make a stand that this company does not support the values the incoming Trump administration represent. The US is fractured and divided, with a lot of fear mongering and charged racial messages. I don't particularly want to involve FreakLabs in politics, but if it came down to choose sides, FreakLabs stands on the side of love and inclusion. I was recently struck by an article that I found a bit terrifying. It was about an automated, cloud connected, IoT pet feeder that stopped feeding pets when it wasn't connected to its' servers. It was yet another Internet of Things failure, but a bit different than the previous fails that mainly consisted of security breaches. This one had a poor failsafe design that didn't take into account the most obvious failure mode, ie: no connection, and defaulted into not feeding the pets when it was supposed to. There are actually many solutions to this, but the main point is that reliability and design was tossed to the wind to focus on how wonderful a cloud connected technology solution to the mundane task of feeding your pet could be. The real tragedy in this story is that real lives were at stake because of this carelessness and it should be a cautionary tale about how much we should trust our technology. One of the things that I've been interested in recently is amplified 2.4 GHz 802.15.4 radios. The standard 802.15.4 radios at 2.4 GHz are around 2mW or so which buys you a few meters of transmission capability. It's not super useful which is why I use a lot of 900 MHz radios. But recently, I've been interested in the 2.4 GHz band again, especially with many devices being used in this band. I decided to throw together an experimental circuit with a low cost 2.4 GHz front end (RF Axis RFX2401C) to see if I can optimize it for good range. Anyways, I'm curious to see what kind of performance I can get. Just wanted to let you all know that chibiArduino v1.06 has been released. 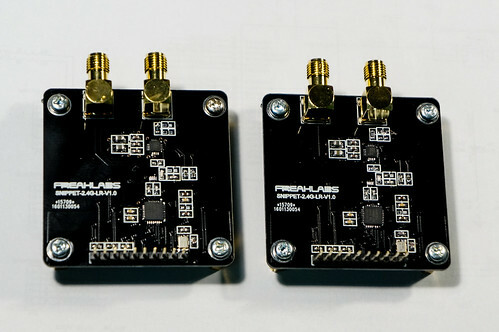 The main purpose of this release is to add functionality to make chibiArduino compatible with sensniff, the bridge software written in python to sniff 802.15.4 wireless packets and send them into Wireshark. I did a full writeup and video on how to use it here. The full release package and details can be found on the chibiArduino page here. Security is becoming more and more important in wireless sensor network, aka Internet of Things, applications. As more devices come online and connect via network, it is important to have the capability to capture packets and study them to debug network issues as well as find vulnerabilities.One of the most powerful tools for debugging networks is a protocol analyzer, and one of the best protocol analyzers is an open source tool called Wireshark. Wireshark, formerly known as Ethereal, captures and displays packets in real time or offline via file dumps known as PCAPs. It has configurable filters, color coding, and many other features that allow you to do deep analysis on network traffic and inspect individual packets. I put together this video tutorial and writeup together to demonstrate how to sniff and capture data packets for IEEE 802.15.4 wireless sensor networks, a common wireless protocol used in Internet of Things applications. Thanks Hackaday. It Was Awesome! I just received a beautiful thank you gift from Hackaday in the mail and was thinking back about what led up to it. This year, I had the great honor of being a judge for The Hackaday Prize, which was a yearlong open hardware/software design contest whose focus was on making something that would improve the world. The grand prize was $200,000 or a trip to space. Incidentally, I had a bunch of arguments with my girlfriend about which prize I would take. I was more pragmatic and would have taken the money. She wanted the trip to space though. Ha ha ha. Here's the link to the Freaklabs Webshop.